Shall we battle the powerful forces of nature? Look closely. Do you see a battle going on between man and the powerful forces of nature? Yes, there are a number of ships in a storm-tossed sea. Count the number of ships. Are there five ships? Perhaps there is a sixth ship just beneath the waves. What type of ships did the artist paint? He painted sailing ships. What clues in the painting tell us these boats are sailing ships? The ships have masts that rise up from their decks, and they have sails. What type of energy is used to power a sailing ship forward through the water? Sailing ships are powered by the wind’s energy. What is wind energy? Wind energy is air in motion. Do you know why the air moves? Air moves, because the surface of the earth is heated unevenly by the sun. Warmer air rises above cooler air to form areas of high pressure. The difference between high and low pressure above the earth’s surface causes the air to move. The result is a constant variation in wind patterns across the earth’s surface. How has the artist shown the power of the wind in this painting? The sails and flags are billowing madly. What part of art has the artist used to show the wind’s energy? Let me give you a clue. What type of lines did the artist use? He used diagonal lines. Eye-spy the many diagonal lines. The masts on the ships, the ships’ hulls, the storm clouds in the sky, and the waves in the sea all have diagonal lines. Are diagonal lines active or restful? Diagonal lines are active and full of energy. Look how the masts on some of the ships are composed of diagonal lines that fall to the left, while the masts on the other ships are composed of diagonal lines that fall to the right. Not only do the diagonal lines show the power of the wind’s energy, they show the power of the water’s energy. 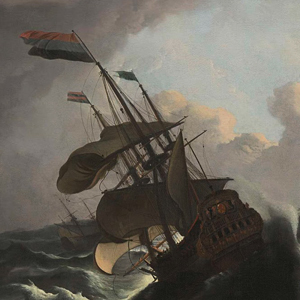 The storm is causing the seawater to form large waves, and the ships are being tossed around. Indeed, an angry sea is about to swallow them up! 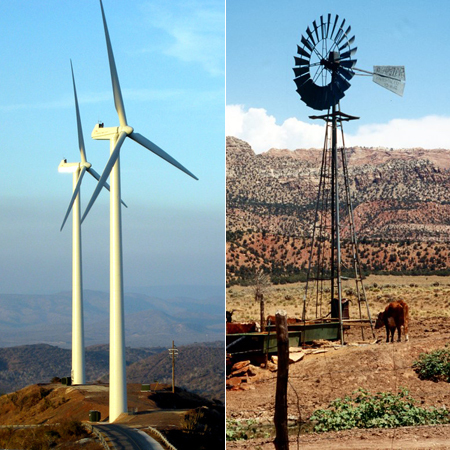 Wind and water have been used for thousands of years as sources of energy. As we see here, long ago sailors captured the wind’s energy in the sails of their ships and explored every corner of the globe. Can you think of another old-time device besides a sail on a ship that uses the wind’s energy? What about a windmill? Long ago windmills were used to grind grain such as wheat to make flour. Can you tell me how a windmill makes flour? Like sails on a ship, the wind is captured in the sails of a windmill. The wind makes the windmill move or rotate in a circle. As the windmill turns, mechanical devices inside the windmill called gears move. The gears then move or power a milling stone to grind the grains of wheat into flour. What about an old-time device that uses the water’s energy? Like windmills, waterwheels were used in a similar way to grind grain to make flour or grind wood into pulp to make paper. Today, a type of water wheel called a water turbine consists of a rotary engine that takes energy from moving water to generate electrical power. Other sources of energy were also discovered. For example, today gasoline is used as a fuel that is burned in most car, boat and aircraft engines to power them around the world. There are a lot of details in this painting. Would you say the details look real, almost like the details in a photograph? When there are many details and the details look real, we call art realistic. This painting has a lot of details and the details look almost as real as they would in a photograph, so we can call this painting realistic. Look closely. Are the ships dangerously close to shore? What details in the painting tell you so? There is a shoreline and a manmade structure on the right hand side of the canvas and mountains in the distance. Imagine you are a sailor on one of these ships. What are you doing? Are you on deck with your fellow sailors working hard to steady your ship? Are you crying out as the waves crash over you? What character traits must a sailor possess to survive a storm like this and harness its energy? Must he or she possess courage and confidence and be skilled and experienced? Make a prediction. Will these ships capsize in the raging storm and plunge the sailors into the water’s depths? Or will the sailors win their battle with the forces of nature and prevent their ships from becoming wrecks on the ocean floor? Base your predictions on what you can see in the painting. Describe the colors. The colors are mostly dark, but the sun is breaking through the pink clouds in the upper right hand side, exposing a bit of blue sky and highlighting the crests of the waves. How do the colors contribute to the mood of the painting? Do the colors create a mood of drama and danger and show the possibility of shipwreck and loss of all hands? The fact that there are more than three million shipwrecks across the global ocean floor tells us how furious the seas can be! Besides storms, what are some other causes of shipwrecks? Shipwrecks occur due to poor ship design, fire, and accidental collision with other ships or rocks near the shoreline. Shipwrecks also occur due to warfare, piracy and mutiny. What if I were to tell you this painting was made three centuries ago when powerful countries in Europe used their navies to fight one another at sea? Would that help you to better understand this work of art? Perhaps the ships in this painting are men-of-war ships on their way to do battle. Why do you think powerful navies engaged in battle? They did so to conquer new lands, make fortunes by trading goods, and cruelly enslave women and men. Sailors had to be on the lookout for bad storms and enemy ships, but they also had to be on the lookout for pirates. What are pirates? Pirates are bandits who attack other ships on the seas. Why do pirates attack other ships? They do so to loot their precious cargo. Have you ever heard of the pirate Blackbeard? Blackbeard was a fearsome English pirate (circa 1680-1718). His real name was Edward Teach. He operated out of the Caribbean and up and down the coastline of the American colonies in the early 1700s—at the same time this painting was made. He would attack ships like these ships to take command of their guns and ammunition. What stories have you heard about Blackbeard? According to lore, Blackbeard would frighten his enemies with his fearsome image. He was tall and had broad shoulders and a very long black beard that he braided into pigtails and tied with colored ribbons. He wore knee-length boots and a long coat of brightly colored silk or velvet. He also wore a wide hat and a sling over his shoulders with several pistols. He would strike matches under his hat to strike fear into the hearts of his enemies! “Blackbeard was a tall man with a very long black beard that reached down to his waist. He tied his beard in pigtails with colored ribbons. He wore a belt over his shoulders with three pairs of pistols. Sometimes he would hang two slow-burning fuses from a fur cap that would crown his head like a wreath of ivy in black smoke. At other times he would set fire to his rum and would drink it, flames and all. Blackbeard terrorized the sailors of the Atlantic and the Caribbean for many years. To conceal his identity, he would attack ships in the dim light of dawn or dusk. Also, he would sail under the flag of a country friendly to the nationality of the ship he was attacking and raise his pirate flag only at the last moment. He would then steal their cargo. Most likely he never killed anyone, but it is told that one man refused to give up a diamond ring he was wearing and Blackbeard cut off the ring, finger and all. Blackbeard’s luck finally turned for the worse when he retreated to a hideaway off Ocracoke Island. There, he and his men held a wild pirate party with dancing and bonfires. Their revelry attracted the attention of the locals, who sent word to the Governor of Virginia about the whereabouts of the notorious pirate and his men. The Governor immediately ordered two ships from the Royal Navy to go to Ocracoke Island and capture the pirate. A terrible battle occurred between Blackbeard and the Royal Navy. With the Navy ships in pursuit, Blackbeard steered his ship, the Adventure, in toward shore. Blackbeard almost crashed the Adventure, but at the last minute he eased his ship through a narrow channel. One of the Navy ships wasn’t so lucky. It went aground on a sand bar. Seeing this ship stranded, Blackbeard quickly fired his cannons at the other Navy ship and killed many of the Navy’s men. Those that survived quickly set a trap for Blackbeard and his fellow pirates. Under the cover of gun smoke, they went into hiding below deck and waited. When Blackbeard and his men boarded their ship, they came out of their hiding places and attacked. The pirates were outnumbered, but they put up a good fight. In the heat of the battle, Blackbeard and the Navy Captain came face to face. They shot at each other. Blackbeard’s shot missed, but the Navy captain’s shot hit the pirate. 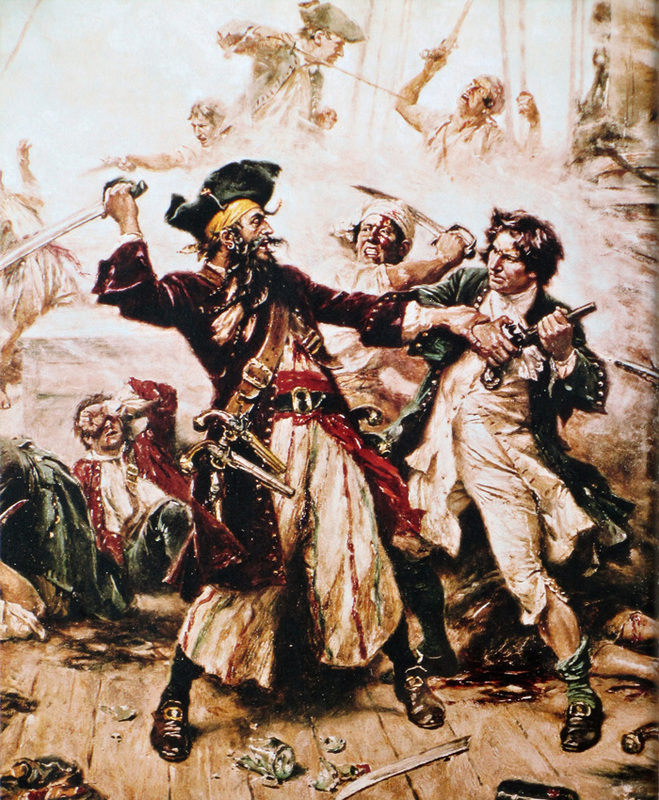 Fighting on, Blackbeard swung his sword and snapped off his enemy’s sword blade. 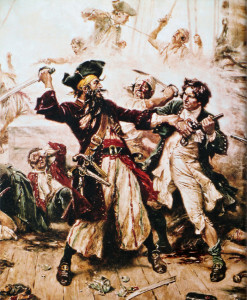 He then prepared to kill him, but one of the Navy men cut Blackbeard’s throat from behind. Some claim it took five gunshots to strike down the notorious pirate and kill him for good. Would you like to see Ships in a Stormy Sea in person? All you have to do is visit the North Carolina Museum of Art in Raleigh, North Carolina. 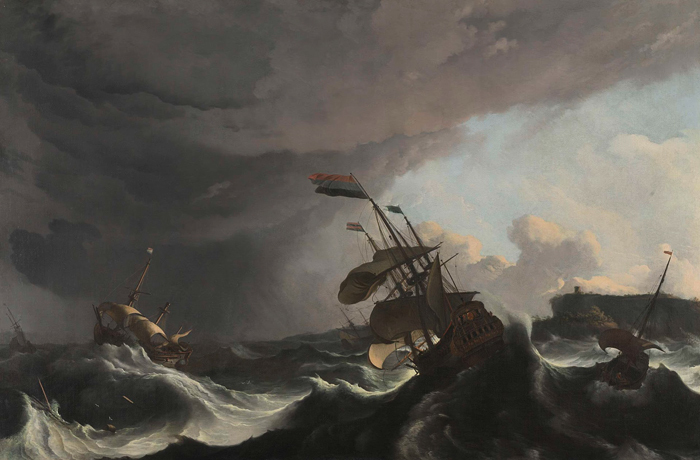 Ships in a Stormy Sea is in the European galleries at the museum. Or perhaps you would like a tour. Tours of the collection are given daily, except for Monday when the museum is closed to the public. If you prefer, you can contact the museum ahead of time and arrange for you and your friends to have a private tour. I’m sure a docent at the museum would be happy to show you and your friends Ships in a Stormy Sea and many other works of art. Whether you visit the museum on your own or have a tour with a docent, it will be well worth your time!